Replacement:WRL-12579. The firmware on this Roving Networks product has been updated from version 4.77 to the 6.15 version. Go check it out! This page is for reference only. This is a simple breakout for the Roving Networks Bluetooth****module. All pertinent pins are broken out and labeled. This new version's headers are unpopulated. Check below for appropriate headers. 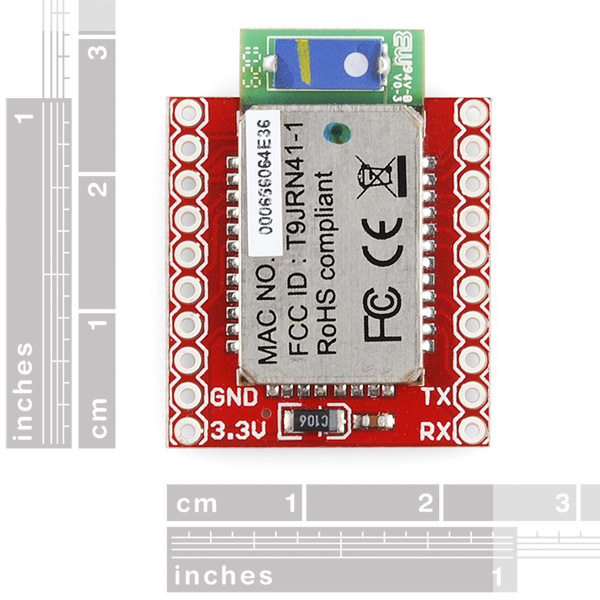 The module from Roving Networks is powerful, small, and very easy to use. This Bluetooth module is designed to replace serial cables. The Bluetooth****stack is completely encapsulated. The end user just sees serial characters being transmitted back and forth. Press the 'A' character from a terminal program on your computer and an 'A' will be pushed out the TX pin of the Bluetooth****module. I am running into a pretty consistent problem. I am using a Macbook Air. When I add a new bluetooth device it recognizes the RN-41 as a keyboard. So i connect a usb explorer and enter command mode to find it states that it is in SrvName=SPP . However if you look on the computer it states that it is a iRN-Keyboard. So i remove the bluetooth device and perform a factory reset, RF,1 from usb interface and rediscover the device. It still reads as a keyboard? So i perform a restart, R,1 and finally the computer sees it as a unknown device. I can connect to it and transmit data. Once I power it down it is the same thing all over again. How is it being recognized as a keyboard when it reports it is set for SPP? Are you guys going to make a breakout board for the RN52 bluetooth audio module as well? Does anyone know if this module works on piconet mode and how, or if there is any BT module able to do so? After some time wasted.. I realize some of the pins on for GPIO the Bluetooth Module Breakout - Roving Networks (RN-41) WRL-10559 module are routed wrong. I see this was raised ~ 3 months ago in this Forum by: Member #367750 --> "..it seems that the pin labeled PIO10 on the breakout board actually leads to GPIO9 on the RN-41, and that PIO11 actually leads to GPIO8. Iâm going off of the RN-41 datasheet version 3.4r 8/21/2012... EDIT: I also just checked the eagle board layout file, which confirms that you have them going to the wrong pins. .."
Will SparkFun address this in the near future? (I hope so..). Makes me really wary of this breakout board.. I just got this in the mail, and it seems that the pin labeled PIO10 on the breakout board actually leads to GPIO9 on the RN-41, and that PIO11 actually leads to GPIO8. I'm going off of the RN-41 datasheet version 3.4r 8/21/2012. Probably something you should look into. EDIT: I also just checked the eagle board layout file, which confirms that you have them going to the wrong pins. I am trying to build bluetooth headphones. Will this work for my purpose? 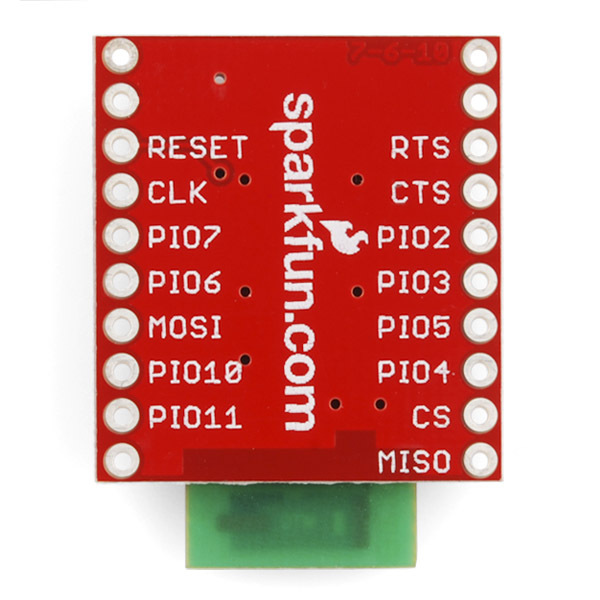 Quick question for the Sparkfun staff: Image Link I see those pads in the datasheet but they aren't connected to anything. Why are they there? They appears to be in the "keepout" area. Are they there to provide another mounting point for the module? Long delay in answering you on this one, but those used to be broken out on the older version of the RN41. We are working on a revision currently for the module's footprint. Update the datasheet link, it is broken as they RovingNtworks changed their website. Another request for antenna clarification. Toni K said it doesn't have one, but I don't see any connection points labeled anything like "antenna". Isn't the blue thingy the antenna? You are correct. Just noticed the confusion on these comments-sorry about that! The antenna is the blue device embedded on the end. Ouch, RN actually makes a breakout board for this device which incorporates an RS232 converter, regulator, LEDs etc and only costs $50 from digikey. Would I need any type of programming to make this module pair with a device? I bought this module and have connected vcc,gnd, tx, rx to a micro-controller. I am able to see the device from my phone but I'm not able to pair with it. It looks like the datasheet link is broken. Does this module include a built-in antenna? I did some digging and it looks like Apple requires some special auth chip to successfully pair an iDevice via Bluetooth. RovingNetworks makes a special model (RN-41-APL) but you cannot buy it unless you are part of the Apple 3rd party accessory program. So here's my question.... What if I just want to discover when an iPhone is in range and then when it goes out of range. Will this allow that. Looking to trigger home automation when I pull into my driveway or when I leave the house. Thx! This isn't 100% true. From RN's website: "iOS devices such as the iPhone, iPad and iTouch can easily connect to Bluetooth hands free headsets and keyboards through the Bluetooth A2DP and HID profiles, however, creating any other Bluetooth data connection is restricted by Apple unless a product is authorized through the Apple MFI program." If you can fit your application into the HID profile, you might be able to get around joining Apple's MFi program. 3months old... but what the hey. I did some quick experimenting because i thought you had a great idea and i might want to steal it (kidding) but it would appear that the iPhone is only "discoverable" when you have the bluetooth on (duh) AND the settings open. With the bluetooth on and the bluetooth settings open, i was able to see my iphone. With the bluetooth on but the settings closed, i was not able to see my iphone. Therefore this great idea might not work, or at least not as seamlessly as you would hope. btw, during the experiment i could see every blackberry in the building, darn apple has everything locked down. Does this only happen the first time? 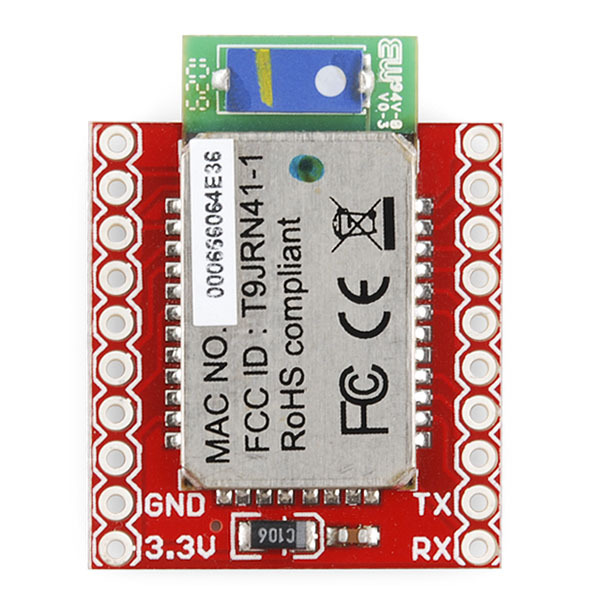 Is there a way to get the RN-41 to try to connect to previously connected devices? Hi, I have problems with serial communication. It works fine with blue-tooth. I connect(short) rts and cts pins and connect rx tx pins through a max232 to tx rx of pc, but nothing happens. then short circuited rx tx of the module and send data via bluetooth still nothing(I guess this should send data back(recieve) through bluetooth). Please any help!!!!! If you can't figure this out in the forums, you might want to contact techsupport@sparkfun.com. WOW -- that was easy. Connect 3.3VDC and ground (I put a couple of decoupling caps on the breadboard anyway), connect a 'scope to the TX output, pair your Bluetooth device with the module (PIN is 1234), and watch the data come in. Very nice! I have, hopefully, an easy question. I have just hooked up my RN-41 breakout board and got my laptop and/or cell phone talking to the RN-41 and received the text on my PC via serial port. Problem is when I type lets say a lowercase "g" I receive an uppercase "L". Everything is messed up.I am transmitting with a usb bluetooth plugged into my laptop or I can use my phone and the same thing happens. What am I doing wrong here? All I want is to type a "g" and receive a "g". Thanks! Long live SparkFun!!!! Check your baud rate and settings on your PC. I think it defaults to 115200, N, 8, 1. Is there a good reason why a PCB and two capacitors cost $35 over the price of the module alone? I can understand some markup, but this seems unusually high. Reflow ovens cost money, testing layout of the board, etc. Roll your own and you will learn that getting the flux cleaned out from under the module once reflowed is a pain, getting it to properly reflow without other issues with the actual module (very small temperature range, etc). It might seem simple, but we do go through a lot of tests to get it right. Download the eagle files, buy the module, and try your own! Or save the time and effort (and possible expense) and get this one. Is there a difference between the RN-41 and RN-42 from a manufacturing standpoint? They share similar packaging and footprints, yet the prices for boards based on the RN-42 have a much smaller price difference over the bare device than similar examples for the RN-41. Thanks for explaining this, Robert. While I do not know how SparkFun incorporates development costs in the final selling price of a product, this pricing still seems inconsistent. They are a Class 1 and Class 2, but essentially they are the same from a manufacturing standpoint. The price of the RN-42 was higher because we hadn't yet bought it in quantity, so I moved it down to a more appropriate (and proportional level). It should be more consistent now. Are the Eagle files available for download? I don't see a link. I've added them back. They got lost somehow. Sorry about that. But yeah, same as the last version. They are available at the page for the previous revision of this module. The only difference is that the headers are left unpopulated in the newer one. These are difficult to reflow. I apologise if this question is a bit silly. What are the differences between this device and the "Bluetooth Mate Gold" (WRL-09358). I see the other has a built in voltage regulation. Is that the only important difference? EDIT: This module does not have the voltage regulation that the Bluetooth Mate Gold has, nor does the pin out match up to the Pros or FTDI boards. My apologies for the confusion about the antenna. This DOES have the antenna built into it. I probably hadn't had my coffee yet when I answered this originally. Many thanks! I must say for the beginners out here like myself, it is a real service to be able to ask questions about products instead of just guessing and then later being disappointed. Thanks again to everyone in the Sparkfun team! 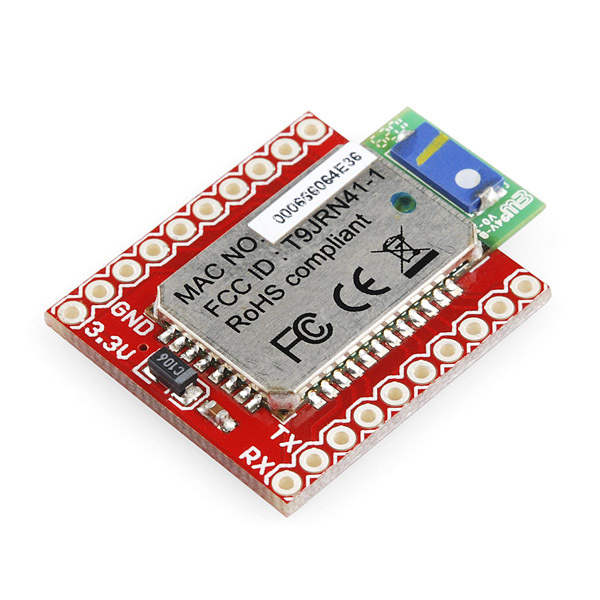 Doesn't this module has a built-in antenna like all the RN41s and RN42s? To use this, it's probably because you need to interface with the RN-41/42 module at a lower level than the TLL connection provided by the BT Mate. This board makes a lot of sense for prototyping PCB designs, amongst other things. RS232 to TTL converter circuit. Thanks for the info. We will try to find the old link. If we can't come up with anything we'll kill the link.